Mike Quade: Needing a copy of the Brewers' and Dodgers' unwritten rulebooks. 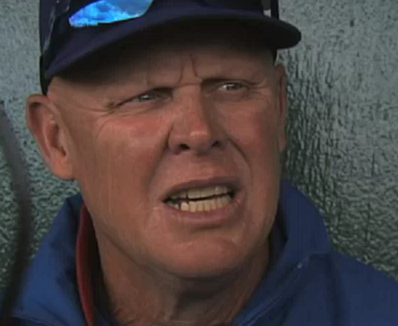 One thing we’ve learned for certain so far this young season: Cubs manager Mike Quade is a fan of the unwritten rules. He gets bothered when they’re broken on his watch, and he’s willing to call out those who diminish their importance or ignore them altogether. First, it was Brewers skipper Ron Roenicke, who inserted pinch-runner Carlos Gomez into the eighth inning of a game in which his team led 5-0, then watched unapologetically as Gomez stole two bases. Funny that “run into to trouble” is the phrase he chose. Not two weeks later, Dodgers catcher A.J. Ellis did literally that when he tried to swipe a base with his team holding an 8-1 lead in the fifth. This seems like a good place to get into Quade’s notion of differing interpretations. When Gomez ran against the Cubs, his team’s 5-0 lead was considered insufficient by Roenicke to shut down his running game, but the eighth inning is without question an appropriate timeframe to have done so. When Ellis swiped his base, the criteria were reversed; there’s little argument that an 8-1 lead is well within the boundaries of “safe,” but the fifth inning might be considered a touch early for some managers to call off the dogs. “I do think I probably need to get a copy of the Milwaukee and L.A. unwritten rules books, too, unless they missed a sign,” said Quade. As it turns out, that’s precisely what happened. After the game, Ellis and Dodgers manager Don Mattingly both confessed as much; Mattingly said his sign to third-base coach Tim Wallach was “missed” (whatever that actually means), and off went Ellis, possessor of zero prior steals over parts of four big league seasons. The play was somewhat mitigated by the fact that Ellis was thrown out. It may also have been mitigated when the Dodgers sent Ellis to Triple-A Albuquerque days later. In a game in 1996, the Giants trailed Los Angeles 11–2 in the ninth inning, and decided to station ﬁrst baseman Mark Carreon at his normal depth, ignoring the runner at ﬁrst, Roger Cedeno. When Cedeno, just twenty-one years old and in his ﬁrst April as a big-leaguer, saw that nobody was bothering to hold him on, he headed for second—by any interpretation a horrible decision. As the runner, safe, dusted himself off, Giants third baseman Matt Williams lit into him verbally, as did second baseman Steve Scarsone, left ﬁelder Mel Hall, and manager Dusty Baker. Williams grew so heated that several teammates raced over to restrain him from going after the young Dodgers outﬁelder. Some good stuff tonight v. the Red Sox ending with Quade yelling 2 to 1, 2 to 1 after the HP umpire warned both benches. Fukedome was hit leading off the start of the game then another member of the Cubs was hit in the face and Big Z hit Youkilis a few innings later that’s when the warnings were called. “Lets Make a Deal”. A well known game show of yesteryears on television. Why not apply it to the game of baseball as well. : ” I promise I will not steal second with a big lead so the first baseman can cover the hole. But you have to promise me the first baseman will not sneak behind me on a snap throw from the catcher”. How about that? . As Mel Allen used to say.